Western tourists in Luang Prabang present alms to Buddhist monks during the morning "tak bat" or monks morning alms rounds. We went to Luang Prabang, a charming town of about 50,000 people on the Mekong River in north central Laos, for a long weekend. 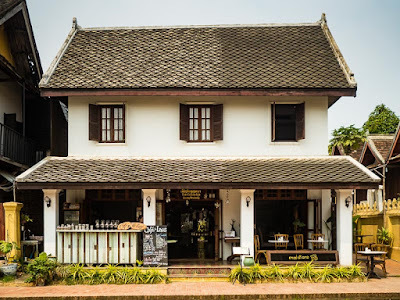 Luang Prabang, one of the ancient capitals of Laos, is a well preserved colonial town, think of it as Chiang Mai Lite (in Thailand), or San Miguel de Allende or Santa Fe (in the Americas). The old architecture has been beautifully preserved and visiting the town is like stepping back in time. One of Luang Prabang's colonial style homes, now a coffee and tea shop. This was my fourth trip to Luang Prabang. We first visited in 2009 and I went back twice in 2013. The first morning we were in Luang Prabang in 2009, going out in the morning to see the tak bat was an amazing experience. The city streets were still dark because the tak bat starts about 6:15AM (sunrise is about 6:20). Hundreds of Lao people lined the streets and the monks padded silently out of their temples past the faithful, who dropped small handfuls of rice into the monks' bowls. A few foreigners participated in the ritual but most watched from the street. Novices (young monks) collect alms from elderly Lao women. This is how the tak bat is traditionally done. A line of monks walk silently down a main street in Luang Prabang. The difference between 2009 and 2016, just seven years, was shocking. There weren't many Lao people participating in the tak bat but hundreds of tourists were. 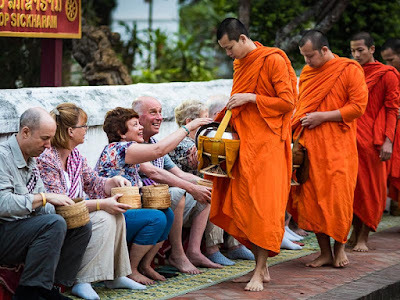 On some streets, tour companies set out dozens of small stools for their clients to sit on, gave their clients baskets of cooked rice (rice in Laos is served in baskets) and told them how to present alms to the monks. 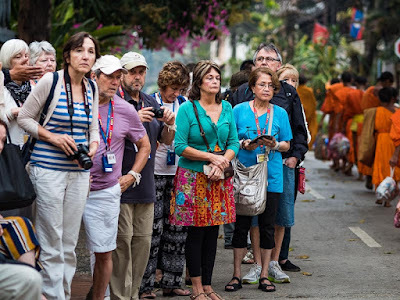 More than 500,000 tourists visited Luang Prabang in 2014. Sometimes over the weekend it felt like the town was bursting with tourists. 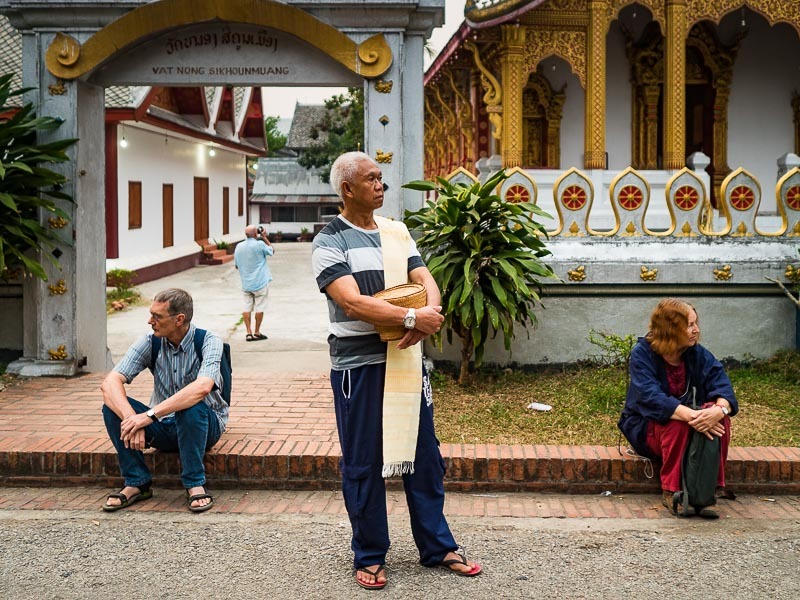 A Lao man (center) waits for monks while tourists sit on the sidewalk in front of a temple. 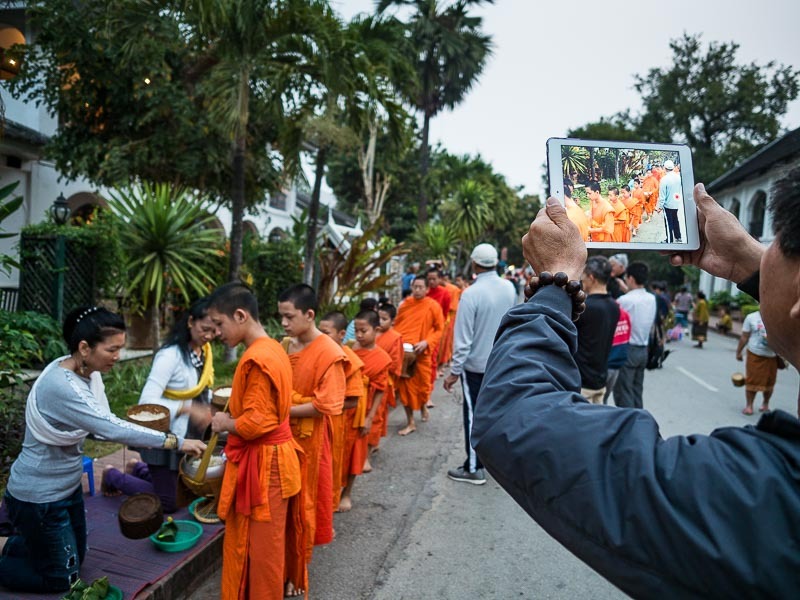 A tourist uses an iPad to photograph the tak bat. 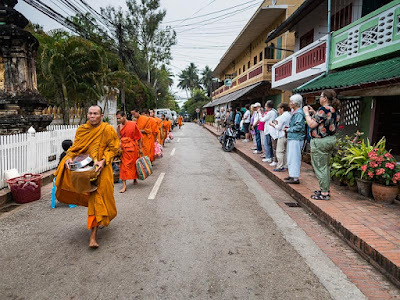 Tourists line the sidewalk while monks pass them. 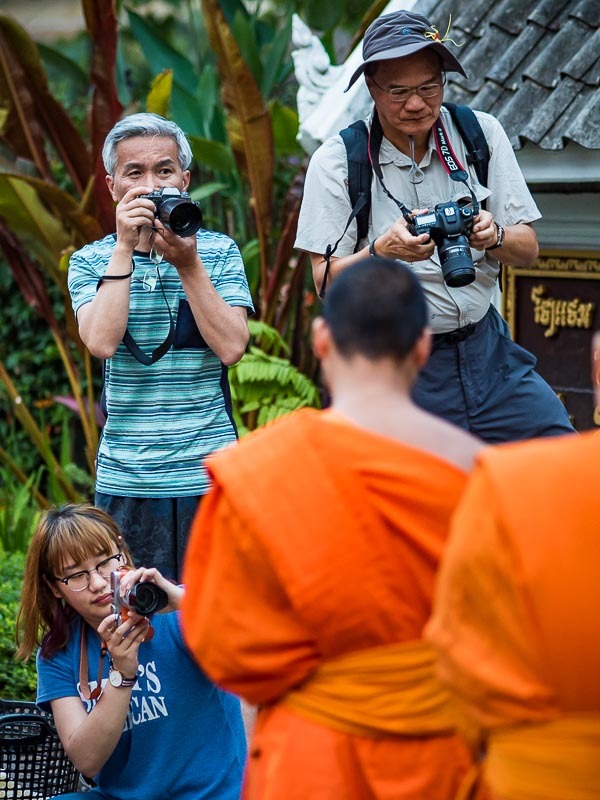 A phalanx of tourists watch monks pass them. It's not just the tak bat that's changed. Wandering the streets of Luang Prabang it felt like there were no Lao people left. It felt like every home had been turned into a guest house, hotel or restaurant. In fact, so many homes on our street had become hotels that the remaining private homes had signs on them that said "Not a guest house." A tuk-tuk (three wheeled taxi) passes a home turned into a guest house in Luang Prabang. Across the street from that guest house a handmade "for sale" sign hangs in front of another home. One morning we stopped for coffee at a small cafe that overlooks the confluence of the Mekong and Nam Khan rivers (Luang Prabang is on a peninsula between the two rivers). Our waiter started chatting with us and we said that weren't many Lao people at the tak bat in the morning. 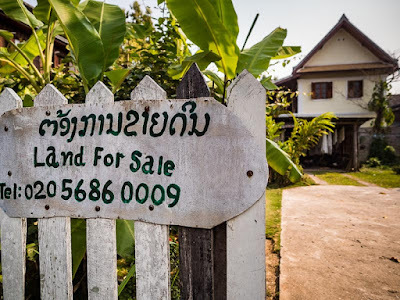 He told us that land prices had gone up so much that most of the Lao people had sold their homes and moved to communities outside of Luang Prabang. 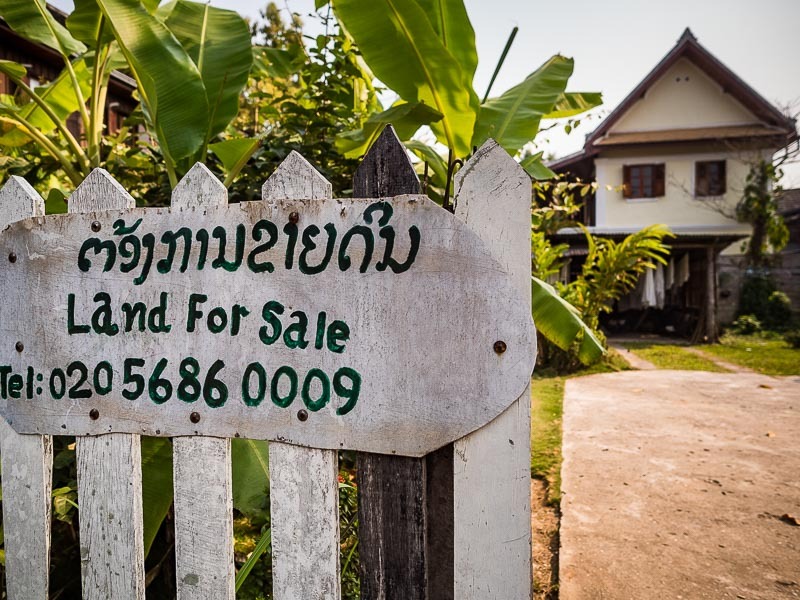 AP reported earlier this year that land in central Luang Prabang that sold for $8,000 three years ago was selling for $120,000 now. In one of the poorest countries in Southeast Asia, a country where the per capita income is about $3,100 (USD), $120,000 more than an average Lao person would make in his (or her) entire working life. 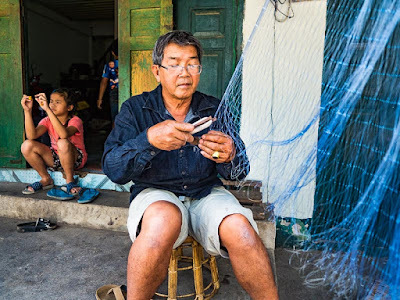 A man repairs his fishing nets in front of his home in Luang Prabang. 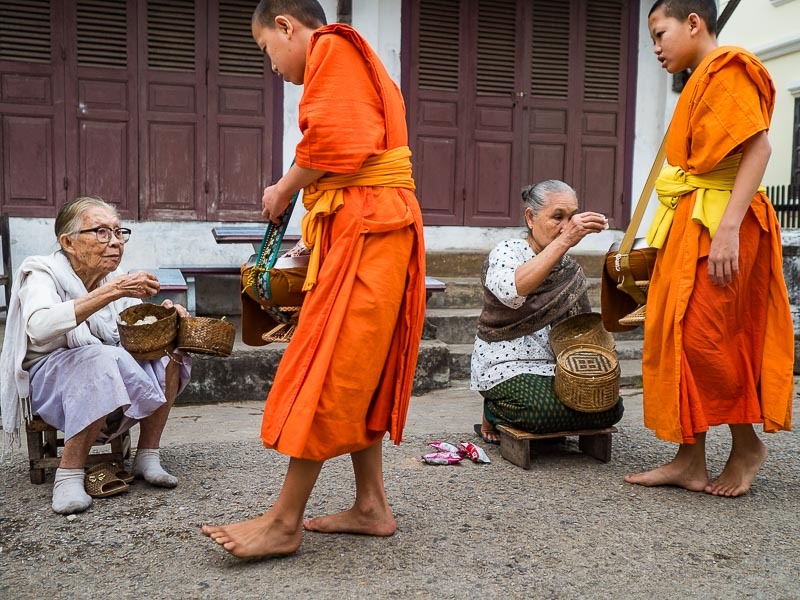 When we were in Luang Prabang in 2009 scenes like this were common. This year, this is the only person I saw doing anything like this. This is a very complicated issue. The people who sell their homes and move out of town have a better life than they did in Luang Prabang. But the town is changing so much, so quickly, that it sometimes feels like a Disneyfied version of what Luang Prabang was. This is a common scene on the tak bat now. Tourists photographing monks. I thought there were a lot of tourists in Luang Prabang the first time we were there in 2009 but that feels like a lifetime ago. 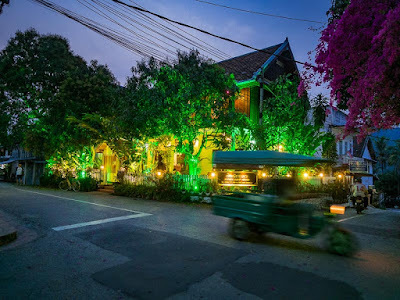 I'm glad to see the people of Luang Prabang are improving their lives, I wish that there was a way to do it without losing what made their town magical in the first place. 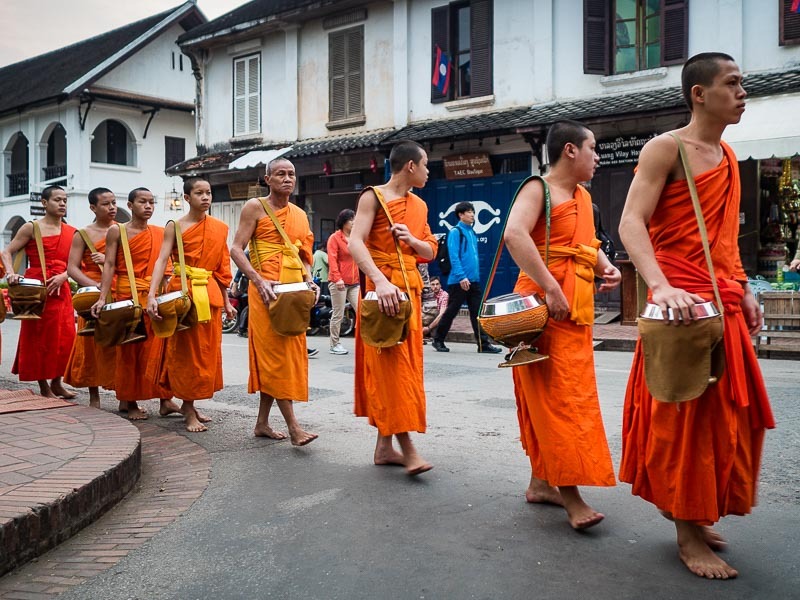 There are many more photos of mass tourism in Luang Prabang in my archive.